When it came to picking our apartment I definitely prefer new build / built in the last few years over somewhere that's bigger but more spacious. The sacrifice with new builds is you definitely get a lot less space. The apartment block opposite us is a lot older but the rooms are definitey bigger but there is a lot of work which needs doing e.g; new kitchen / bathroom which is a no no for me. Did you know British homes have actually halved in size over the last 90 years or so. This means we are buying shorter length or narrower than standard beds for smaller bedrooms. New houses in Britain on average are only 92% of the government's recommended size which actually makes them smallest in Europe...think London! Its no surprise that in 2016 John Lewis have sold 53% more "small double beds" compared to 2015. The small double beds are 15cm shorter than traditional beds which is a LOT in my opinion. For us, our room is a good square shape which means we can only fit a bed in the middle with 2 small side tables and nothing else. I decided to sacrifice space for a king size bed, after all you don't really spend much time in the bedroom other than sleeping so why not make it as comfy as possible and for us the bigger the better. 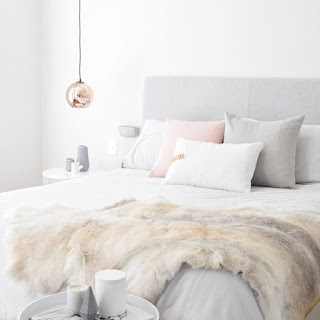 In collaboration with BedGuru I have put together 5 simple tips to help you maximise what you have in your bedroom what ever the size and tips on getting a good night sleep. Yes, I am a massive fan of clearing out crap and making the room minimal. When you have so little space you don't have room for things you don't need. Clear out is one of the simpliest things you can do for free. Fitted wardrobes which go right up to the ceiling can make a huge difference and maximising space. Or a bed with storage give you so much more extra space. Fresh lick of white paint will make the room seem bright and airy and avoid curtains opt for wooden shutters or blinds to give it a modern fee. Minimal art on the walls, nothing too busy looking. Open the window at least 30 minutes before you sleep to get the fresh air circulating. You sleep a lot better with fresh air in your room. Avoid gadgets like phones / tablets before bed so you can slowly / properly unwind before you drift off. How do you ensure you get a good nights sleep? This post was written in collaboration with Bed Guru.